Select your Ethernet network card to configure. IPv4 network protocol is sufficient, as IPv6 is not yet common, so select [No] and press Enter when prompted whether to enable IPv6 interface. Network configuration screen will be shown next. Use Tab to move between various fields to enter the required information. 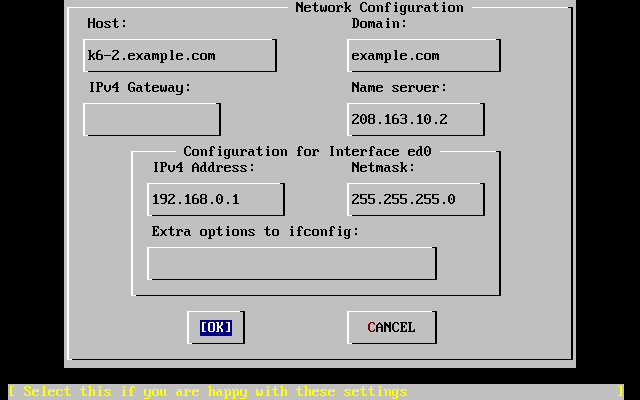 If you have DHCP server, most of the fields, including IPv4 Address, Netmask, Name Server and IPv4 Gateway, should be filled up, you only need to enter the Host and Domain (if need to change). Host is the fully-qualified hostname, such as k6-2.example.com in the illustration below, and Domain is the name of the domain that the server is in, such as example.com. When done, use Tab key to select [OK] and press Enter. Select [Yes] and press Enter if prompted to enable the network interface. Select [No] when prompted whether want the server to function as network gateway. Select [No] when prompted whether want to enable inetd and network services. No will disable ftp and telnet service, as SSH is a more secure method to access the server remotely. Select [Yes] and press Enter when prompted to enable SSH access to securely access the server remotely. Disable anonymous FTP access by select [No] when prompted. Select [No] as it’s not a NFS (Network File System) server. Select [No] for NFS client. There is no need to customize any system console settings such as font, keymap or screen saver, so select [No] when prompted. Set the time zone by selecting [Yes]. Most computers are set to local time, and not UTC, so select No to continue. Use arrow keys to scroll and select your region, or continent. Use arrow keys to scroll and select your country. If you’re in a country that span across several time zone, then select the time zone of your location when prompted. Select [Yes] and press Enter when asked if the name of time zone looks reasonable. Enable Linux binary compatibility by selecting Yes. Select [No] when asked if the system has mouse, as there is no X-Windows installed. Select [No] when asked to browse the FreeBSD packages collection to skip it. Select [Yes] when prompted to add user to the system. It’s advisable to set up at least another user for regular use instead of using the powerful root to work on the system. Select User to add user at the screen. User tab to move between field, and enter your desired User ID and password for the new user. 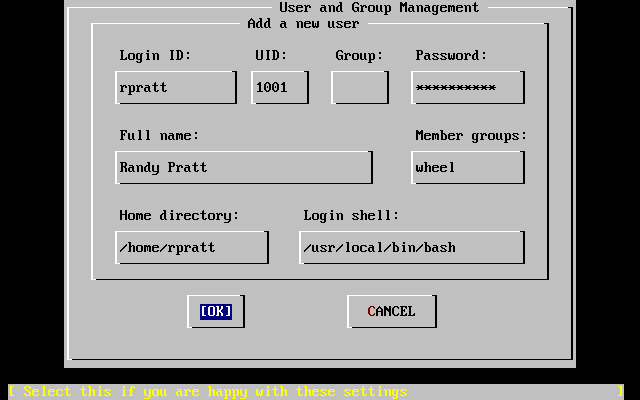 For Group, enter ‘wheel’ (without quote – to allow the new user to perform administration tasks). Other settings can be left blank for default. When done, select OK and press Enter. 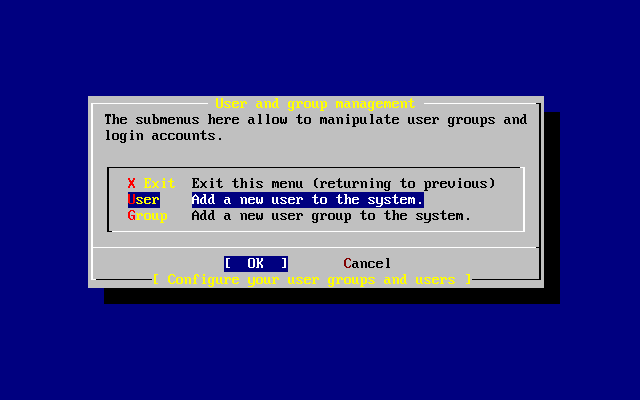 When back at the User and Group Management screen, select Exit and press Enter. Press Enter to set the password for root system manager. Key in the new password for root twice. Select [No] and press Enter when asked to review the configuration set to skip the review. When back at sysinstall Main Menu, use arrow keys to select “Exit Install” and press Enter. Select Yes to reboot the FreeBSD system. While rebooting, remove the FreeBSD CD. When the system boots up, it will ask for an entropy source to create the secure keys. Just randomly enter some characters and numbers and press Enter to continue. 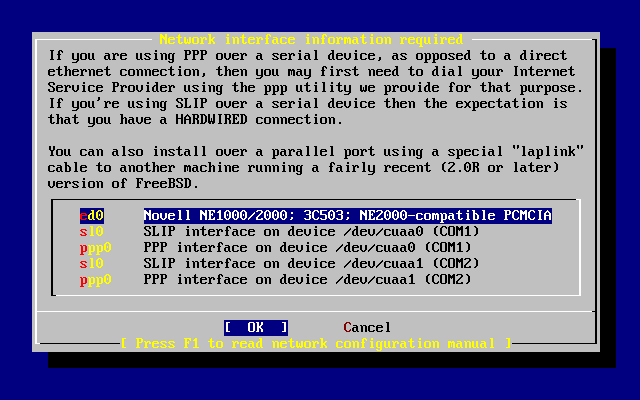 The set up, installation and configuration of a FreeBSD system completed. The system can now been remotely administered by using Secure-SSH client such as Putty, by connecting to the IP address that is configured just now.